In the wake of Netflix's Roma winning Best Director and being nominated for Best Picture at the 91st Annual Academy Awards, there’s been an ongoing battle on whether streaming companies should be allowed to enter film festivals and compete for awards. This battle begs the controversial question: should Netflix films receive equal treatment at the Oscars as theatrical releases? Legendary director Steven Spielberg has spoken out in the past about his belief that Netflix films should only be eligible for Emmys rather than Oscars. That said, Spielberg is campaigning for eligibility rule changes that would require all movies up for an Academy Award to be shown in theaters for longer theater runs, perhaps up to four weeks. I’m sorry, but how does increasing how long movies stay in cinemas make a movie more ‘Oscar worthy’? Oh wait, it doesn’t. They just want to block Netflix. In response to this heated debate, Netflix released a short statement. (include picture attached below). The devil works hard but Netflix’s PR team works harder. Just saying. 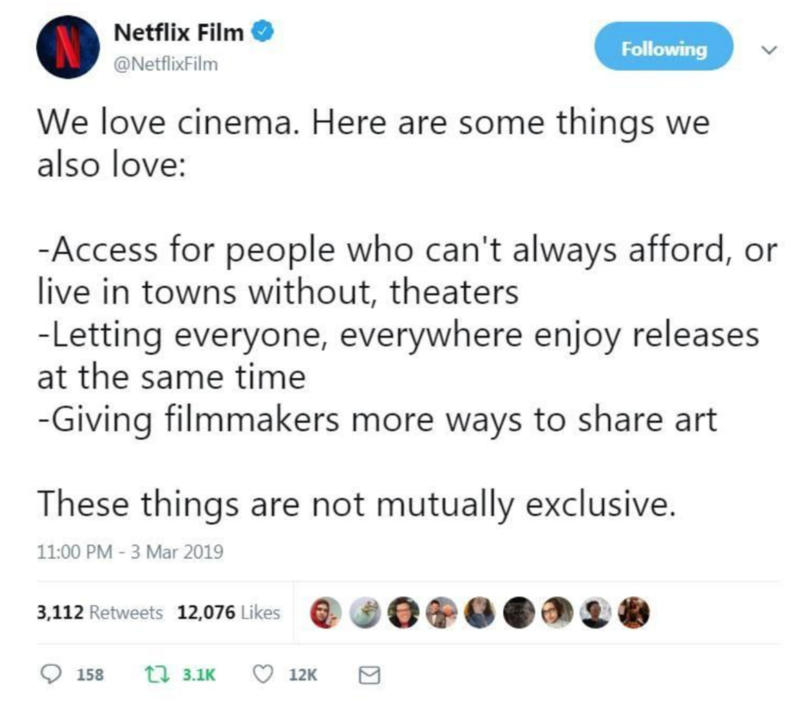 Such restrictions would not only prevent movies from Netflix being qualified for an Oscar, but also could disqualify independent films that spend a short amount of time in theaters. Now this is just messed up. These poor indie movies already have a hard time competing with Hollywood. Yet, with these damn new rules, they won’t stand a chance because they’ll arguably receive even less recognition and views. So basically, only Hollywood films can be eligible for Oscars? That’s what it looks like. I mean, there would be no Oscars without Hollywood, right? WRONG! As it is, not much happens in Hollywood without Netflix. With $6 billion to spend on content every year (and $8 billion in 2018), Netflix has become one of Hollywood’s top financiers. With big names like Adam Sandler and Paul Greengrass, Netflix has handed over god knows how much money to Hollywood’s rising and top stars to create content. Is Netflix preserving Hollywood, then? Basically. You’re welcome, Hollywood! The movie business is ultimately trying to destroy Netflix, despite Netflix being a huge reason why the industry remains alive. Nice going, Hollywood. The biggest problem with the film industry is that needs to adapt to the times. Before the streaming age, Hollywood refused to embrace diversity. The industry’s track record on showcasing minority talent and storylines is disgustingly sad, as they book predominantly white casts. But within the last few years, Hollywood has suddenly diversified its casting. Why? Two words. Streaming services––aka Netflix. Netflix has arguably been a leader in producing and distribute diverse types of content. Do movie theaters make a movie? Movies can be described as a motion picture that tells a story and can be view in a cinema, on television, and/or the internet. Many in the Academy view Netflix as a threat because it dismantles the very palaces that started the business. But that’s not what makes a movie so it shouldn’t matter. Without streaming services, Hollywood would be irrelevant. Netflix saved Hollywood. Some Netflix films follow the current Academy rules. It is diversified, and most importantly, provides people all around the world an opportunity to easily see new movies. So, why shouldn’t Netflix films be considered for Oscars? Why should they only be able to qualify for Emmys? Why should streaming services be punished for being ahead of the game? Perhaps this ‘battle’ is the beginning of the end – the beginning of an era where streaming companies will triumph and Hollywood becomes obsolete.